Wells, Maine is a wonderful vacation travel experience with the Amtrak Downeaster. Travel to the Wells Amtrak Station and Downeaster Packages will take care of the rest. You can swim, sunbathe and stroll along the nearly three miles of continuous oceanfront, bordered by sand dunes and sea grass. Wells is also in close proximity to other destinations serviced by Downeaster Packages. Ogunquit, Kennebunkport and Portland can all easily be traveled to for day trips. There is also a trolley shuttle system that can be utilized in the high season. 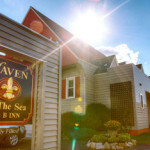 Our hosts at Haven by the Sea will take great care of you during your stay.